During the annual peak of malnutrition and malaria, MSF increases its teams in Zinder, Tahoua and Maradi regions. During the annual peak of malnutrition and malaria, Médecins Sans Frontières (MSF) increases its teams in Zinder, Tahoua and Maradi regions. This year we are employing more than 1,430 people in health structures and villages to prevent, detect and treat the diseases that affect children under five. In Niger, the lean season before the harvest is when the number of cases of malnutrition is at its highest, and it coincides with the arrival of the rains and an increase in malaria-transmitting mosquitoes. This combination can be lethal for young children if they do not receive treatment in time. During this period, MSF is employing more than 1,430 people in health structures and villages to prevent, detect and treat the diseases that affect children under five. The focus is on prevention, and strategies to treat children as quickly, and as close to their communities, as possible. Since 2005, MSF has been working with the Ministry of Health in the paediatric units at the hospitals of Madaoua, Madarounfa and Magaria. Last year, the Dungass paediatric unit also reopened. In total, there are more than 1,200 beds available to meet the medical needs of under-fives. explains Hassira, a mother of three. 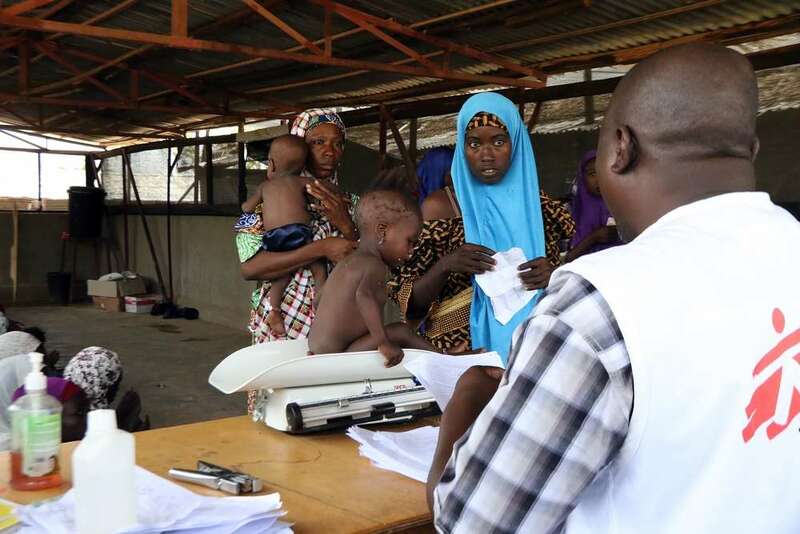 In Niger, more than 800,000 children are at risk of moderate and severe acute malnutrition, according to the United Nations Office for the Coordination of Humanitarian Affairs (OCHA). The regions of Maradi, Zinder and Tahoua are the most severely affected. Between June and mid-September, more than 6,400 children with moderate and severe malnutrition, exacerbated by medical complications such as anaemia, were treated at the Intensive Therapeutic Feeding Centres supported by MSF. Most of the children admitted to the MSF paediatric units suffer from malnutrition coupled with other medical conditions such as malaria. These children are screened for diseases like HIV and tuberculosis (TB), to which they are more vulnerable, and are vaccinated if necessary. Their caretakers are also tested for HIV and TB. Too many infant and child deaths in Niger are still linked to diseases that can be easily diagnosed and treated. To fight against this, a comprehensive and integrated approach is needed, which can make it easier for children suffering from the most common childhood diseases to access healthcare. By working in communities and by supporting hospitals, MSF is developing this approach with the Ministry of Health. In the Maradi and Zinder regions, MSF supports the health authorities by providing a range of services that combine outpatient treatment for severe malnutrition, detection of malaria and the treatment of other childhood diseases. Teams are working in 16 health centres and three health posts. The most seriously ill children are treated immediately and are moved to stabilisation rooms, before being referred to hospital if necessary. In six health centres in Madaoua district, MSF is also ready to support the health authorities in case of an influx of patients during the peak. In 44 villages in Maradi, community health workers trained and supported by MSF screen and treat patients for uncomplicated malaria. Between June and mid-September, 13,000 children were treated at home for free, and 750 were referred to a health facility. This community approach makes medical care more accessible. Health promotion on issues that directly impact children’s health is also very important. In close collaboration with the health workers and community outreach workers, teams go from village to village to discuss topics such as breastfeeding, the importance of vaccination and using insecticide-treated mosquito nets, as well as the risks of traditional medicines to treat illnesses. Since the beginning of the peak in June, more than 108,000 children have been treated by MSF in the various hospital and community programmes in the regions of Zinder, Tahoua, and Maradi.